The Houston Texans could either face the Chiefs, Raiders or Dolphins in the playoffs. HOUSTON (KTRK) -- The Houston Texans are heading to the playoffs but who they will face is still undetermined. The Texans are locked in as the fourth seed after beating the Bengals 12-10 on Christmas Eve. That means the Texans will host either the Kansas City Chiefs, the Miami Dolphins or the Oakland Raiders in the wild card playoff game. - The Chiefs lose to Chargers and the Miami Dolphins lose to the New England Patriots on Sunday. The Raiders lose to the Broncos and the Chiefs beat the Chargers on Sunday. Note: Raiders starting quarterback Derek Carr is out indefinitely with a broken fibula in his right leg. The injury occurred on Sunday against the Colts. Backup quarterback Matt McGloin is now starting for the Raiders. The Dolphins beat the Patriots and the Chiefs lose to the Chargers on Sunday. Note: Dolphins starting quarterback Ryan Tannehill has been suffered ACL and MCL sprains in his left knee. It is possible he could return during the playoffs. Backup quarterback Matt Moore has been starting for the Dolphins in place of Tannehill. 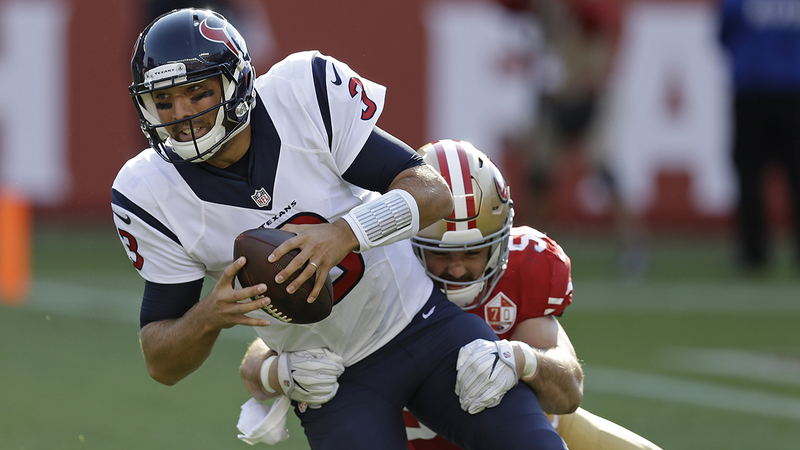 The Houston Texans are sticking with Tom Savage at quarterback on Sunday against the Tennessee Titans.